Can I get Telfast Online without a prescription? 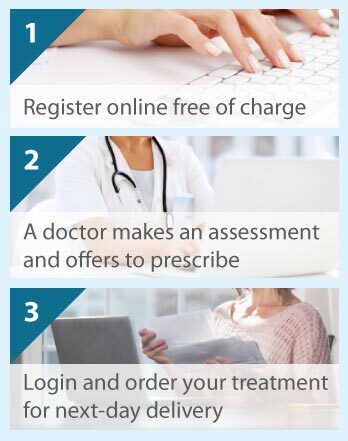 The Online Clinic can prescribe Telfast (fexofenadine) online even if you do not have a prescription as we have doctors on the staff who can write a prescription for you if it is an appropriate. All you have to do is complete a quick online questionnaire so that an assessment can be made. This item is dispatched for next day delivery. Telfast is used to relieve the symptoms of hay fever. Telfast comes in tablet form and contains fexofenadine, a non-sedating antihistamine, meaning that it doesn't make you drowsy and slow you down. Telfast works by calming your immune system's allergic response to allergens, such as pollen. Specifically, Telfast works by inhibiting histamine, released in response to allergens, from activating histamine receptors responsible for initiating a cascade of reactions that result in an allergic response. Allergic responses are usually centred on the eyes and nose and include inflammation of the eyes and nose, itchy watery eyes and nose, sneezing and nasal congestion. Telfast is available as 120 mg tablets. You are recommended to take the tablets with a glass of water, irrespective of food. The recommended dosage is one 120 mg tablet per day, as needed. You should not take more than the recommend dose. If your symptoms persist, please let us know if we are the prescribing clinic. You should not take Telfast if you are breastfeeding or lactating and should not be given to children if they are under the age of 12. You should use Telfast with caution if you are allergic to any of the ingredients in the tablets, if you are elderly, have renal or liver problems, or suffer from conditions affecting your cardiovascular system. The most common side effects of Telfast are headache, drowsiness, nausea, dizziness and fatigue but the vast majority of people do not get any side effects whatsoever. Please click on the free consultation button to begin. Any orders received before 4.00 pm Monday to Friday will be dispatched that day for delivery the following day.